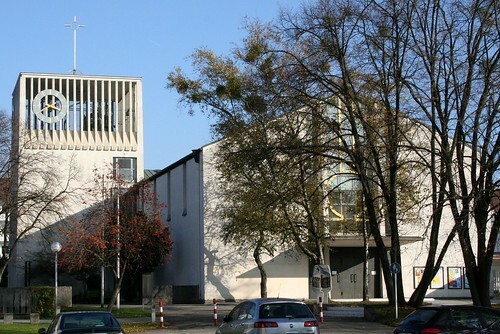 While Sep Ruf‘s Bogenhausen Church of St. John Capistran is very well known and is featured in almost every architectural guide for Munich, probably few know the first church, Ruf built in Munich: Zu den heiligen zwölf Aposteln in Laim. On the same spot, there already was a “Notkirche” which had been erected in 1928. 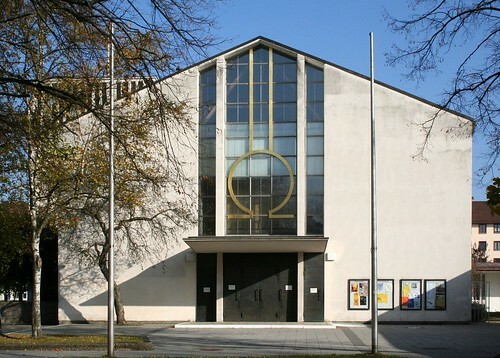 Then in 1936 there had been a competition for a church building, that had been stopped by the National Socialist building authority. 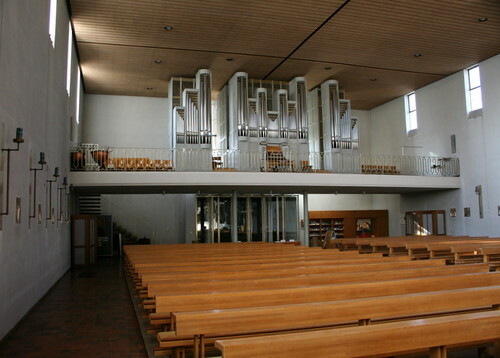 The project was revived in 1951 after the new city parish had been created. 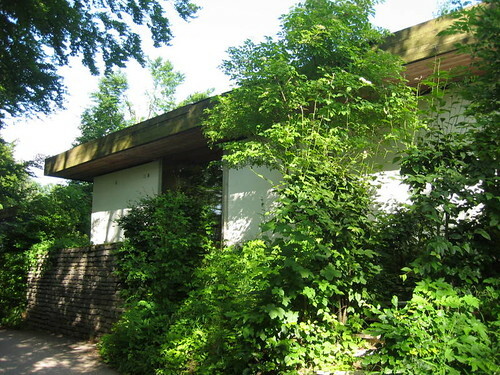 Ruf won this competition with a modest, white plastered brick building in simple geometric forms reflecting the frugal character of post-war Germany. 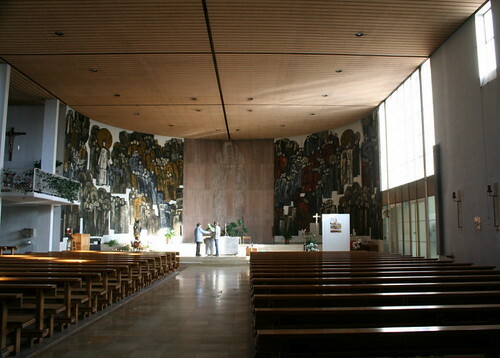 Zwölf Aposteln is a single-nave hall church with a semi-circular apsis (relief of Last Supper and Last Judgment by Karl Knappe) with a quite chunky belfry in the North and vicarage in the South. 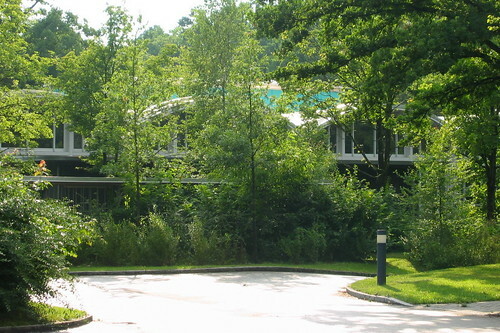 Here are another building by German modernist architect Sep Ruf, that is not as well known as for example his Neue-Max-Burg buildings or the bungalows above Tegernsee. 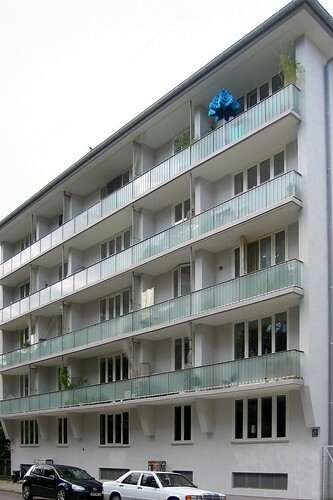 It’s an five story apartment house on Heßstraße in Munich-Maxvorstadt. 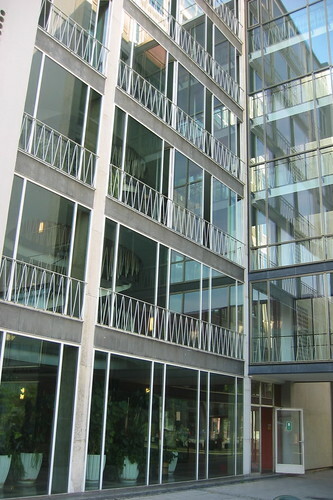 While it does not appear as floating or weightless as many of his other buildings, it still embraces the idea of openness as is clearly stated by the large balcony. And with its narrow windows (unfortunately replaced with noise reduction windows that compromise the overall impression a bit) so typical for Ruf’s architecture, it does carry a certain elegance. The house had been constructed in 1952 for the co-owners of the property. In the 16th century, William V, Duke of Bavaria, built a new palace near the Michaelskirche and the Jesuit monastery on Neuhauserstraße. In 17th century this residence became known as “Herzog-Max-Burg” because of duke and regent Maximilian Philipp choosing this building as domicile. During Second World War the Max-Burg had been destroyed almost completely. Only the tower remained more or less intact. 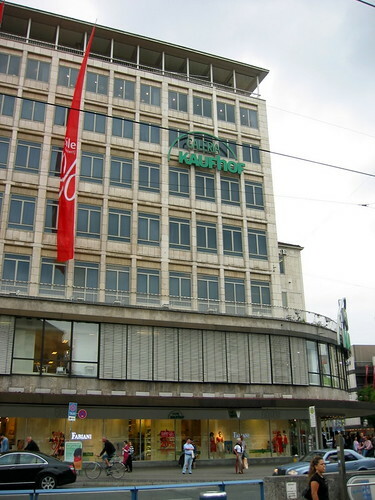 From 1954 to 1957 Sep Ruf (1908-82; see also here and here) and Theo Pabst (1905-79; see also his department store) constructed a new building complex on this historical location: the “Neue Max-Burg”. 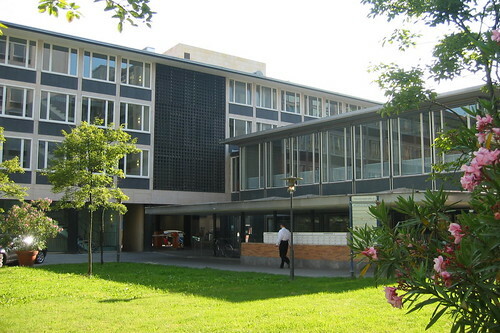 The building had been used as a juridical building and is internationally acclaimed for the intelligent and innovative combination of old and new. 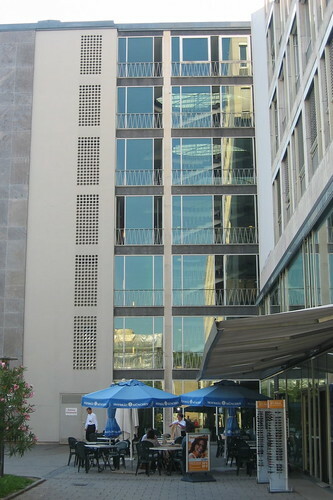 Ruf and Pabst modeled the raster and color of the facade after the appearance of the renaissance tower. But they did this without any hint of historicism: the ferro-concrete construction remains visible. Another highlight is the freely suspended canopy above the entrance. 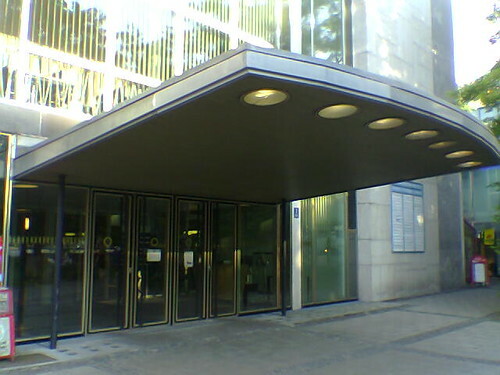 While architectural critics praised the Neue Max-Burg as one of the most interesting modern buildings in architecturally conservative Munich, the population needed much time to adapt to this building. When this building had been built in 1950-51 by Theo Pabst, it had a euphoric touch to it. 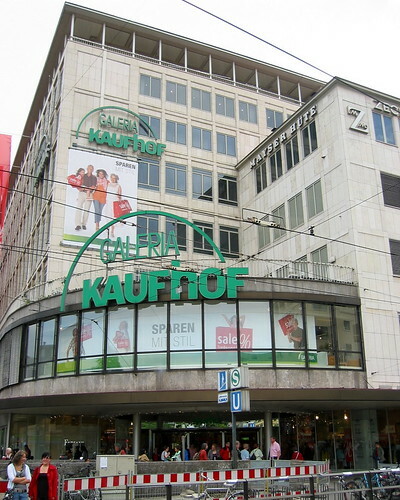 This Kaufhof had been the first new department store that had been built in Munich after Second World War. It was a symbol of the new economic growth and increasing affluence of the citizens. But as historians will tell you, there had not been a complete break with the nazi system (“Stunde Null“). Many of those involved in the daily crimes of the regime were back in power at this point of time. This especially holds true for the architects. In my opinion this building is a very striking symbol of the mixture of break and continuity after the “Third Reich”. 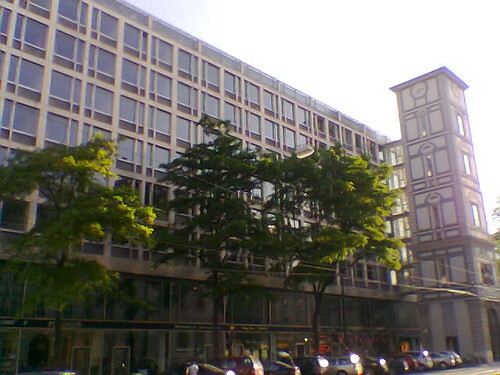 The left and larger part of the building which faces busy Sonnenstraße is modernist cube with grid facade and a flat pillared roof. 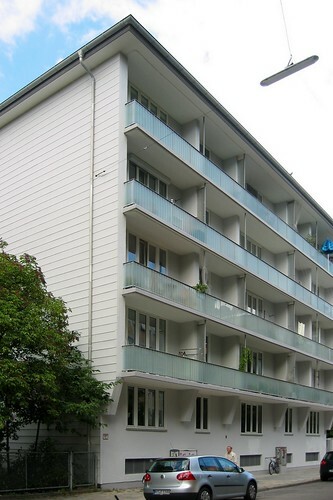 But the right part of the building facing Bayerstraße looks much more conservative with its pitched roof. 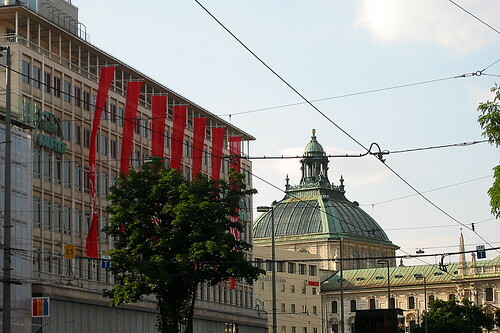 Munich city administration insisted on this design. Althogh both parts are joined together by a curved gallery which once had a terrace café, they convey a inharmonic impression. Modernity and tradition does not match all too well in this building. 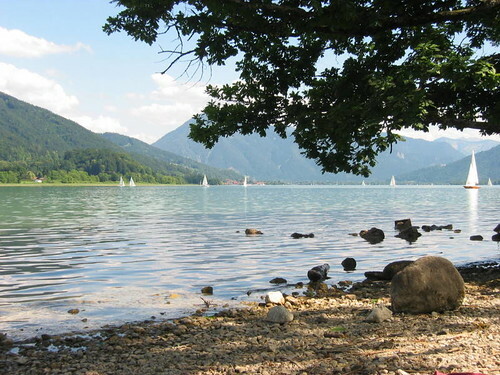 If you are looking for the roots of Bavaria, you don’t have to look any further than lake Tegernsee. From here, the monks set out to eventually found the city of Munich (= monk’s town). 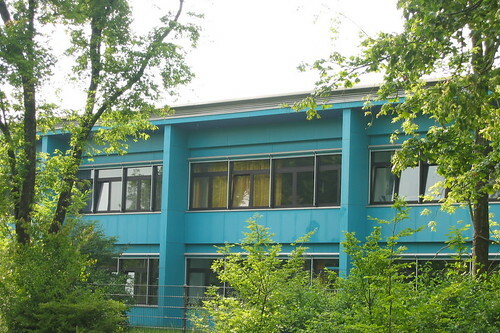 Here (at Wildbad Kreuth) the conservative party of Bavaria gathers whenever there are important decisions to be made. 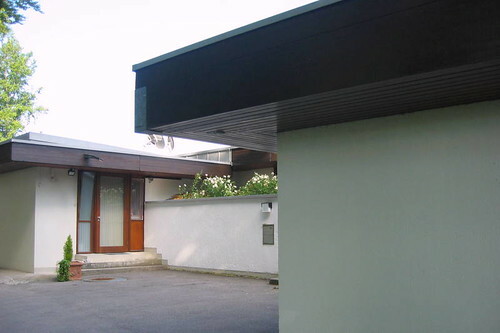 What a uncommon place to find one of the finest examples of architectural modernism from the 1950s – light, but still perfectly fitting to the locale. 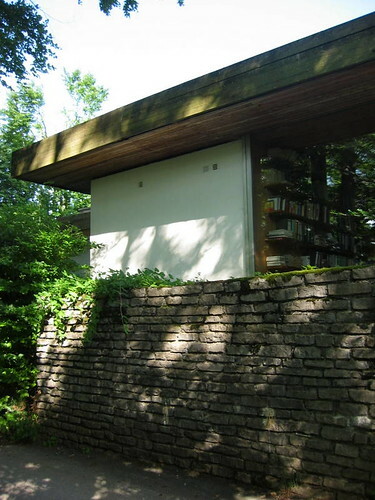 But still, this is the place where Sep Ruf, one of post-war Germany’s most important architects, settled and build himself a bungalow, at the Ackerberg above the small town of Gmund am Tegernsee. And not for himself, he constructed a building there but also for Ludwig Erhard, then Minister of Economics and later from 1963-66 German Chancellor. 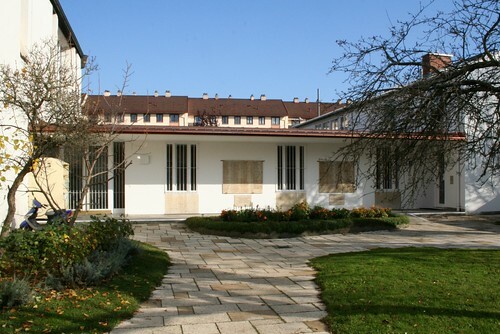 This year the Munich architectural museum in the Pinakothek der Moderne celebrates Sep Ruf’s 100th anniversary with a special exhibition opening on 31 July 2008. 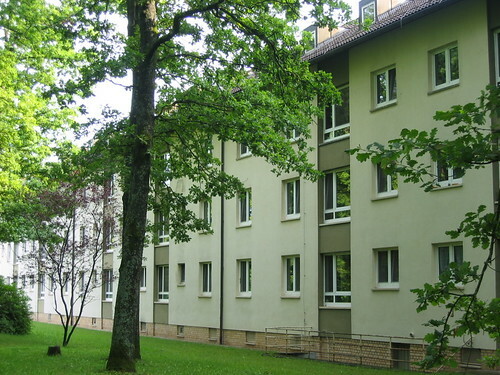 After the war, the US miltary administration erected many buildings for their staff in Germany. 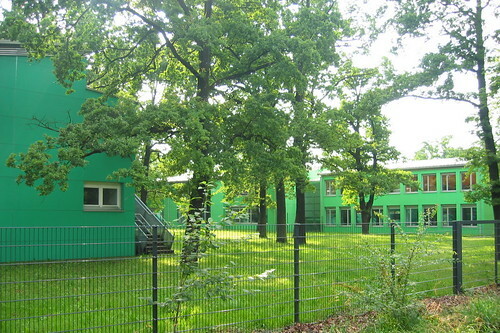 A fine example of modern architecture in post-war Munich was the US school centre at the housing area Cincinattistraße / General-Kalb-Weg (Google Map) in quiet suburban Perlach. 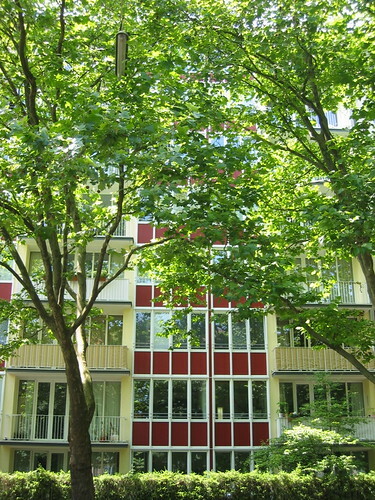 The housing area had been built in the 1950s by Karl Loibl, Hans A. Endres, Immanuel Kroeker, Otto Roth and Carl Kergl and included a cinema, a PX store and a hamburger restaurant. 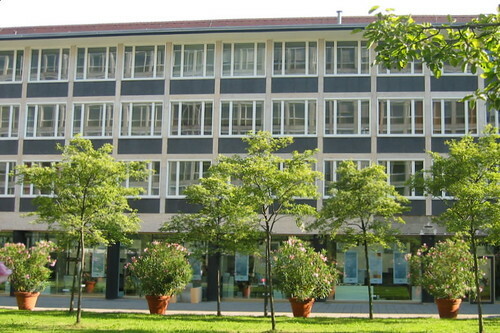 Not only had the school been built after the modern concept of age-specific environments – small buildings for the 60 children in primary school and larger buildings for the 30 children in secondary – buit had all the amenities like recreational rooms and a cafeteria – then unknown in German schools. Unfortunately the friendly and light original architecture has been heavily modified between 1994 and 2003 and the characteristic 1950s interior decoration has been lost completely.